Art Review: "Twisted," new work in fabric and sculpture by Wylie Sofia Garcia and Jake Rifkin. Flynndog, Burlington. Through December 30. Jake Rifkin and Wylie Sofia Garcia each put a distinct spin on “Twisted,” the title of their show currently at Burlington’s Flynndog, with wire sculptures and textile pieces, respectively. Garcia, whose fabric works obliterate the line between fine art and domestic handiwork, also presents 24 ink-on-paper pieces. This shared exhibit is filled with subtleties, surprises and unconventional approaches to making art. Rifkin does more than twist wires, of course: He weaves them into large, airy abstractions. He often uses heavier-gauge wire to outline his forms and weaves thin wire, such as three-dimensional string art, inside this framework. In the 32-by-32-by-60-inch structure titled “Tremble Then Explode,” a hexagonal mass appears beneath a circle of negative space near the top of the piece. Rifkin added color in the form of copper, steel and red-tinted wires. Suspended from the ceiling by monofilament, the sculpture hovers a few inches above a white pedestal. Rifkin’s abstractions look organic and cellular. “Don’t Leave Me Standing Here” is a vermicular, 8-foot-long horizontal piece based on a tangled double helix that runs through circles in the sculpture’s armature. Rifkin again employed red wire in the piece, and he embedded a few cutout metal shapes, like organs inside a body. “Happy Lucky Perfect Land” does not use colored wire, and its simplicity is a nice contrast. The smallest-diameter section of the roughly conical, 50-by-30-by-30-inch vertical sculpture is suspended over a pedestal, giving the piece an upward movement like a tree trunk opening into a canopy. Garcia’s textile works evoke surreal samples of stitching and quilting, but they possess surprisingly sophisticated arrangements of color, texture and line. Each of the 12 pieces in her “Beijing Translation” series is a pastiche of fabrics mounted on a red or black background. “Beijing Translation I” is the only rectangular piece in the group. A 14-by-24-inch black background supports the vertical form cobbled together from several bits of pale cloth. Its interior is a bunch of tightly quilted red and pink fabrics sewn with freeform lines. An area of blue at the top of the composition brightens the hues, and loose strings are lashed across the black backing. “Beijing Translation XI” is mounted on a 9-by-9-inch black square. 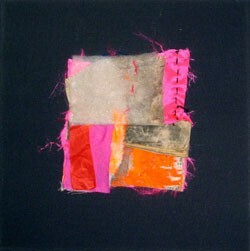 Garcia used fluorescent-pink satin, worn-out orange silk, tattered gray material and white cloth in the piece. She is essentially painting with fabric. The red-backed “Beijing Translation IX” is a 16-by-16-inch piece with a simpler design. A pink floral-print swatch with one button attached runs along the top of the piece. Below is a dirty piece of canvas with interesting gray wrinkles. Tracks of blue thread are sewn in all directions. Garcia’s engaging ink-on-paper paintings present an enigma: How were they made? Typical of these works is “Venus Triptych,” a 24-by-60-inch piece in which various sheer fabrics appear in negative on black backgrounds. Each of these has the look of a rayogram — the result of a photographic process in which objects are laid on film, which is exposed to reveal a white-on-black image. But Garcia’s works are black ink. Perhaps she sprayed or atomized ink on and through the fabrics? Regardless of the technique, her ink-on-paper pieces are outstanding, presenting the viewer with a new look at textiles as an aesthetic resource. Garcia also layers gossamer textiles to create waves of gray patterning as transparent as jellyfish and as amorphous as smoke. “Twisted” is the Flynndog’s final exhibit of 2008. In Burlington’s ever-changing constellation of galleries, this South End venue is now one of the most venerable. The 2009 season is sure to be another banner year.